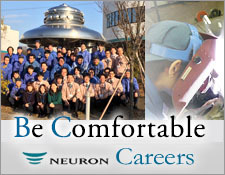 About us | NEURON JAPAN Co., LTD. The direction we wish to go in as a company. An introduction to movements in our company’s business content, and occasional topics. A map of our organizational structure. A list of plant certification and staff licenses/qualifications from ministries and associations. Information on access to our company, Kansai Science City, and local hotels. Aiming for the construction of “Labor Health and Safety Management” and the acquisition of “Environmental Management”.